The Japanese American Confinement Sites consortium is united but seeks more consistent financing. The group of organizations affiliated with former Japanese American confinement sites is more united than ever but has challenges paying for its long-term mission, leaders said during a robust three-day meeting held in Washington, D.C., on Feb. 26-28. The Japanese American Confinement Sites Consortium is a nationwide network of historical organizations, education institutions, advocacy groups and grassroots organizers focused on preserving the sites and artifacts related to the World War II incarceration of Japanese Americans and dedicated to educating the public about this history and its still-relevant lessons. During its meeting, which was largely held at the law firm offices of Hogan Lovells, who sponsored many of the week’s events, the JACSC discussed long-term funding for long-term impact as a primary goal for plenary sessions. JACSC received start-up funding from the federal Japanese American Confinement Sites grant program through awards in 2015 and 2017. Having identified a mission of capacity building for individual members, preservation and advocacy, it seeks firmer footing by generating ongoing funding. As a result, the JACSC gave tentative approval to a sustainability proposal requiring its member organizations to pay 1 percent of their annual operating budgets in dues, sat with members of Congress to seek continued funding for the federal JACS program and held a congressional briefing on federal immigration issues. “All of our organizations are holders of this history. We have come together to think beyond this moment to consider our long-term impact, which we cannot achieve without becoming sustainable,” said Ann Burroughs, chair of the JACSC Advisory Council and President/CEO of the Japanese American National Museum in Los Angeles. “This is a historic meeting not just for our consortium but also because of the context in which we find ourselves as a nation,” she said, referencing how the unjust incarceration of Japanese Americans relates to the recent Trump Administration Muslim ban and ongoing immigrant detention issues. “The question is not can we be sustainable but how we can be sustainable,” Burroughs continued. JACSC needs between $45,000 and $55,000 annually to sustain its core efforts, including paying its part-time executive director, Brian Liesinger, running its new website, organizing two national meetings and keeping its member groups informed about developments within the Japanese American community, according to Doug Nelson, vice chair of the Heart Mountain Wyoming Foundation. The dues, Nelson said, would not have to start until the beginning of next year if the board of directors for the various coalition groups approve them. Nelson urged members to also look for major donors willing to support long-term financial stability for the consortium, but he acknowledged that it might be difficult to find funders willing to provide annual operating grants on an on-going basis. So far, some of the consortium’s start-up costs have been paid for by federal grants, but the Japanese American Confinement Sites program is primarily aimed at preservation and research projects and not operational support. The recent meetings provided the most concrete results for the JACSC, which has moved slowly to promote unity and common cause among the various groups since its first gathering in Washington, D.C., in May 2016. One recent success and ongoing activity of JACSC is collaborative advocacy for the JACS grant program itself. The program was eliminated in the president’s budget for fiscal year 2019. JACSC stakeholders were able to mobilize together quickly to support the funding program and highlight the long-term benefits from nearly 200 projects that have been funded by the grant program. For 2019, the efforts paid off, and funding was restored. JACSC awaits the release of the fiscal year 2020 budget, with the expectation that JACS will be included. The continued support for the JACS program was a major theme of the meetings with senators and representatives on Feb. 27, as consortium members fanned out across Capitol Hill for a day’s worth of meetings. Time was spent educating legislators about the JACSC, advocating for JACS grant funding and discussing border issues and the treatment of immigrant families in detention. Individual stakeholders also met with their respective congressional delegations, and a JACSC leadership group met with key allies and members of crucial Congressional committees. JACL Executive Director David Inoue, part of the leadership of the JACSC, set the tone for the group in preparation for the visits. A delegation also met Feb. 28 with House Speaker Nancy Pelosi (D-Calif.), who said that she supports continued JACS funding and new efforts to highlight the parallels between the incarceration and present-day fears over alleged threats posed by certain immigrant groups and the dangers they present to the nation’s security and identity. “What happened to the Japanese Americans is something we must own up to,” Pelosi said about the incarceration and efforts to preserve the confinement sites. She told Norm Mineta, the former Cabinet secretary, House member and Heart Mountain incarceree, that she was honored to vote for the Civil Liberties Act that compensated the Japanese American incarcerees during her first term in Congress in 1988. Consortium members called their meetings with their delegations encouraging. Members of the Heart Mountain Wyoming Foundation said their state’s three-person congressional delegation, all Republicans, supported continuing JACS funding and doing whatever they could to help the foundation, which operates an interpretive center about 50 miles east of Yellowstone National Park. Created in 2006, the JACS program was authorized to spend $38 million to pay for various programs to preserve or restore parts of confinement sites as well as educate the public about the incarceration. In 2018, funded projects ranged from $13,464 for the Friends of Minidoka to digitize items in its collection to $398,272 to Full Spectrum Features to produce two documentaries about resistance to the military draft and the resettlement of incarcerees around the country during World War II. So far, about $27 million of the JACS money has been spent, which gives the program about three more years left on its current funding level. Mineta suggested that members of the coalition look beyond preserving the remainder of the initial authorization to getting Congress to back another authorization beyond the first $38 million. He also urged the coalition to reach out to the leaders of the congressional committees that would reauthorize the program — Sen. Lisa Murkowski (R-Alaska) and Rep. Raul Grijalva (D-Ariz.). Both represent states connected to the incarceration, as Japanese Americans living in Alaska were incarcerated during the war, while Arizona was home to two camps — Gila River and Poston. 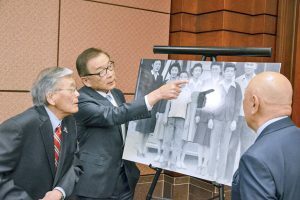 The comparisons between the Japanese American incarceration and the forced separation of immigrant families at the border were at the center of a congressional briefing, sponsored by the American Psychological Assn. in collaboration with the HMWF, the JACL and JACSC, on the morning of Feb. 28 at the Capitol Visitors Center. Arthur Evans, president and CEO of the American Psychological Assn., joined JACSC members and Rep. Mark Takano, a California Democrat whose family members were incarcerated at the Heart Mountain, Wyo., camp. Evans compared the Japanese American incarceration with the plight of immigrants to the United States who have been placed in internment camps while they await their claims for asylum. The incarceration, Evans said, broke up families, which had serious effects on the children as they grew older; that impact is similar to the separation of families at the border, he said, which has a particularly strong effect on children. Evans visited Heart Mountain last October and said that the experience affected him profoundly. Sam Mihara, a Heart Mountain incarceree as a child, talked about the incarceration’s effect on his family, including how his grandfather’s colon cancer was treated incorrectly, which caused him to die prematurely. What he saw during his visits was appalling to Mihara, who reiterated that what happened to him should never happen again to anyone else. “What happened to me and my family at Heart Mountain is just one of thousands of stories,” he said. “Similar injustices and trauma were experienced by tens of thousands of other Japanese Americans who have stories to tell and lessons to teach — all designed to help make sure that this great country never again abandons its fundamental values and constitutional protections. Former U.S. Sec. Norman Mineta also spoke at the briefing and was heavily involved with the week’s JACSC events. Mineta was a part of the political leadership involved in the redress movement as a co-sponsor of the Civil Liberties Act of 1988, when he was a U.S. Representative from California. He now serves as chair of the board of trustees of JANM. Mineta relayed the story of his father gathering the family together in their San Jose home to calm them after the attack on Pearl Harbor. But soon after, they were removed from the home they so cherished. The consortium also continued to strengthen its connection to the government of Japan. The Embassy of Japanese hosted a Feb. 27 reception at the Old Ambassador’s Residence next to the embassy. Embassy officials also attended a Feb. 26 reception at Hogan Lovells. Kazutoshi Aikama, the embassy’s deputy chief of mission, welcomed the group and said that the Japanese government was eager to work with consortium members to highlight issues from the incarceration and raise awareness of it in Japan. Embassy ministers said they planned to attend some of the pilgrimages at the various confinement sites this year. The JACSC is guided by an Advisory Council of five organizations who have signed a Memo of Understanding pledging significant resources toward the consortium. They include Friends of Minidoka (Executive Director Mia Russell), HMWF (Board Chair Shirley Ann Higuchi and Vice Chair Douglas Nelson), JACL (Executive Director David Inoue), JANM (President/CEO Ann Burroughs and Trustee Harvey Yamagata) and NJAMF (Board Chair Larry Oda and Vice Chair John Tobe).